Or get the Gendron Tarot Deck or book separately. Back of card: Black field of stars, with thin gray/brown frame. In center, a blue sphere (earth?) with flowers with a violet field around it. Quite pretty. May be inverted. Book included: Yes, 224 pages, 6 x 8.95 inches, or 152 x 229 mm. Title: The Gendron Tarot, by Melanie Gendron. Illustrated. Publisher: US Games. Deck printed in Italy, book printed in Canada. I am that which emanates beauty and all manner of life, moon, dancing stars, abundant earth, ocean's depth to match my heart. I pierce the void and multiply variety innumerable. I am love without condition for I am all that is. Every act of love celebrates my spirit. I am guidance, sanctuary, your highest self; I am the way home. Hear my call and come to me for we've been separate only in dreams." We've had this deck for some time before we could get it up. A houseguest fell in love with this & instead of scanning, we got lots of readings. It was a fair swap, I think. Look at the Ten of Swords. Compare it to the Rider, or the Cosmic Tribe, both of which feature swords piercing human bodies. Here the swords stand as guardians to a ten-step path. My idea is the ten swords represent ten trials on ten ascending steps to the prize at the top. A friend saw it differently: The figure at the top has to take ten important steps to get down to the matter at hand. As we've said before, what you see on a card is what's important. This card, a refreshingly different Ten of Swords, lets you see both upwards and downwards. That's good. Suits are the usual Swords, Wands, Pentacles & Cups. Court cards are King, Queen, Prince & Princess. 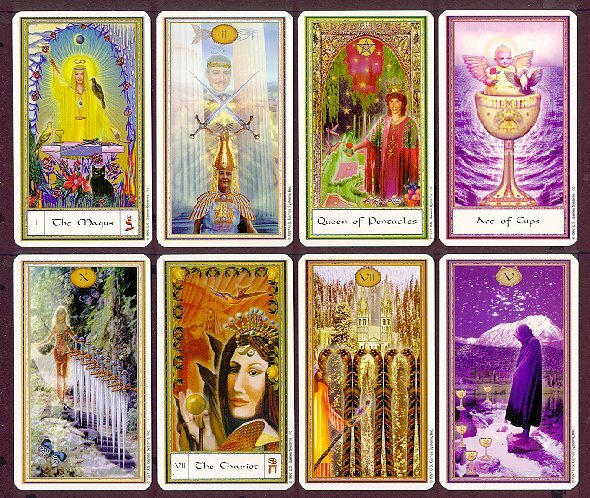 Major Arcana (in order): Fool, Magus, High Priestess, Empress, Emperor, Hierophant, Lovers, Chariot, Strength, Hermit, Wheel of Fortune, Justice, Hanged One, Transition, Temperance, Deceiver, Tower, Star, Moon, Sun, Judgment, Universe.